Ready to Step Up and Take Your Business to the Next Level? 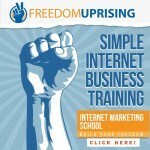 Congratulations on making the decision to join our Simple Freedom Internet Business Training School. 1. It dramatically cut down the “learning curve” of building my business. 2. It gave me clarity and focus. 3. It allowed me to zero in on what was right for MY business and ignore a lot of the things that simply don’t matter. 4. It helped me generate increases in exposure, traffic, leads and conversions. 5. My business has consistently generated residual monthly revenue. You can find me fastest on facebook by “LIKING” my page and sending me a message. It’s the fastest, most efficient way to reach me and to find more valuable training and tips. Click here to connect with me on facebook.